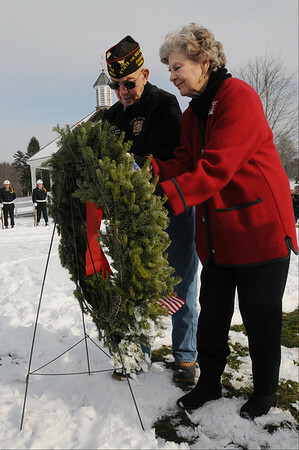 Joanne Patton lays a wreath at Patton Park with the help of John Williams, president of Wreaths Across America. The Wreaths Across America convoy stopped in Hamilton on it's way to Arlington National Cemetery. Photo by Ken Yuszkus/Salem News, Monday, Decmber 7, 2009.